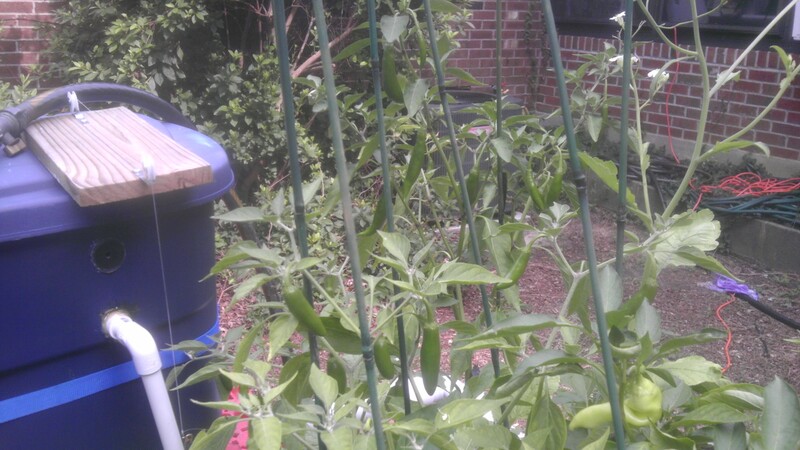 Just a up date on the Aquaponics system, Peppers are doing great. 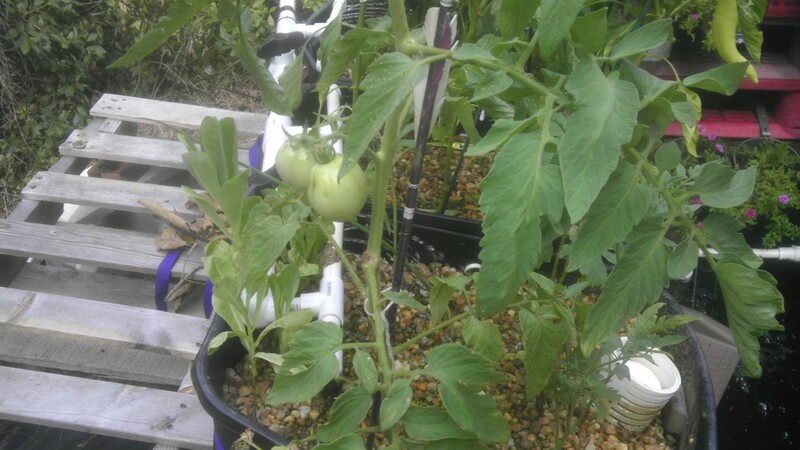 The couple of tomatoes that were suckers that I placed in the beds are putty on fruit. 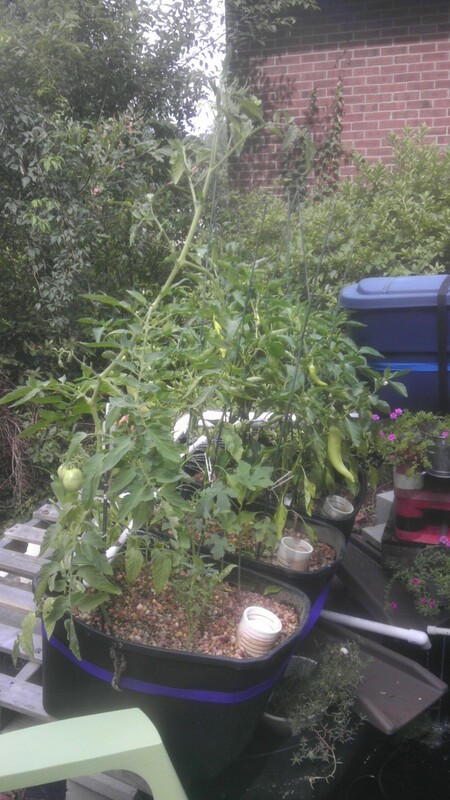 So here are some shots of the peppers and the system. 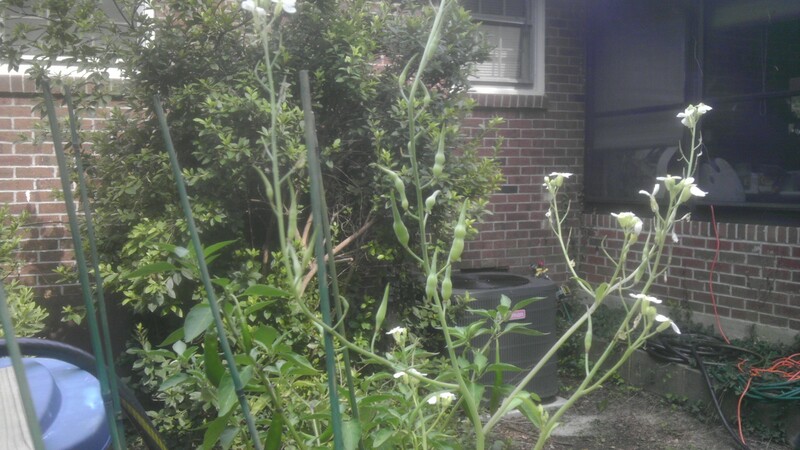 The radishes never did much but they are putting on pods now so those will be good in some stir fry. This the celery that I started from the bottom of stalk from the store. I have also planted the onions that i started from the cuttings. Sorry that it has been a while since I have updated this blog. I have been swamped lately. These are some pic I took this morning to help explain how the valve on my flood tank works. this a post from a forum that I am a member of. I will take some better pictures of the flood valve tomorrow and post them. It is pretty simple , It is a soda bottle with a hole in the cap and the bottom cut out. It is connected via fishing line over two wheels to a toilet tank valve. There is a tube coming out of the flood tank at a height that will fill the grow beds when it empties. The tube directs the water that over flows through it to the bottle. As the bottle fills up, the weight of the water in the bottle overcomes the weight of the water in the tank holding the valve closed. This then essentially flushes the tank through the tee valve at the bottom then to the grow beds. As the water drains out of the bottle the weight of the valve over comes the weight of the empty bottle and closes the valve to stop the flow to the beds. This shows the bottle and the overflow tube. This is the hole in the cap of the bottle. This shows the line ans the safety pin holding it. Better look at the pin and swivel. The wheels are from a sliding door repair kit. This is shot of the toilet tank valve. The rusty piece you see are washers that I added fro weight to help the valve close when the water empties from the tank. 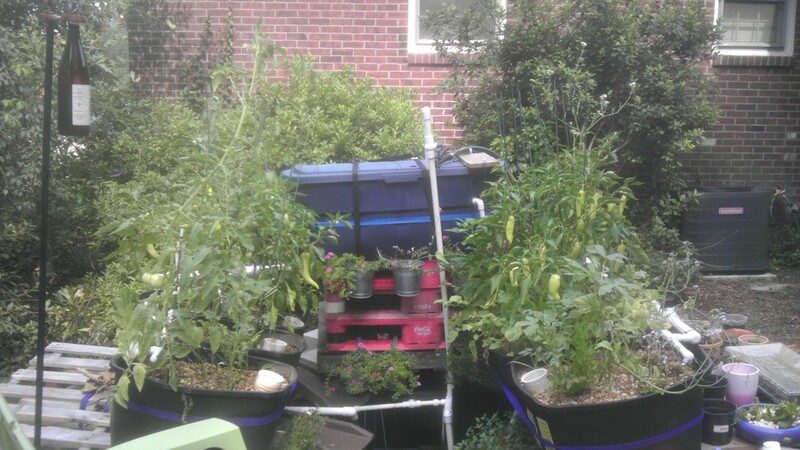 And here are several form the grow beds , as you can see the peppers really seem to like the growing in the system. This bed is sort of experimental, I have celery growing from the bottom of a celery I bout at the store. 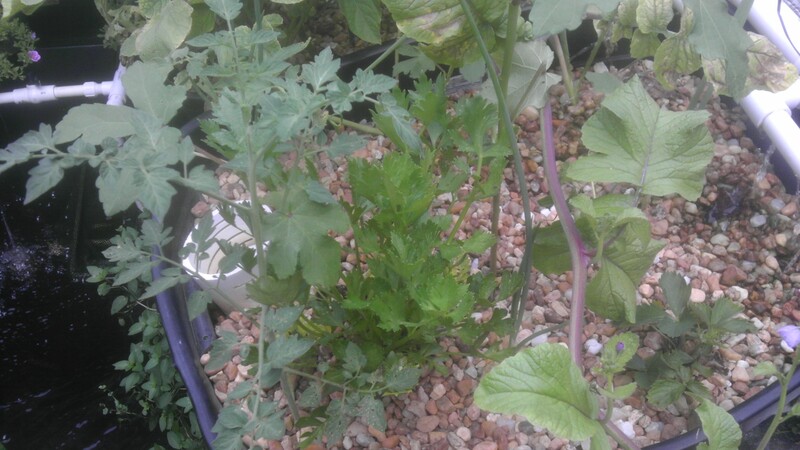 Also some Okra And some onion that are growing from the bottoms of green onions I also cut off others. In the above are tomato’s that were suckers pinched off my garden tomatoes, and more Okra and onions. 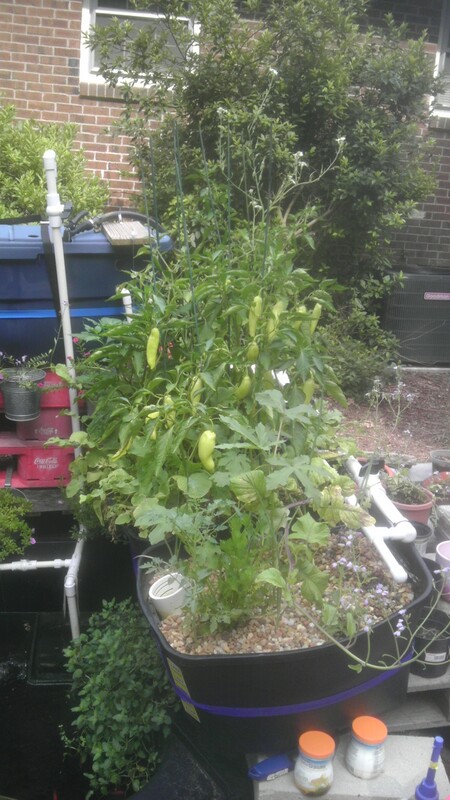 Here are just some of the pepper on the plants. I have already canned 7 pints of pickled hot peppers.Won’t be long before I need to put some more up. I hope that explained it for . If you have any other questions about the system don’t hesitate to ask. That said I am very new to AP systems and I am learning as I go.